Devlin Designing Boatbuilders, In collaboration with West Satsop CNC, has brought the Devlin design catalog to independent boatbuilders as a precision cut CNC kit. All of Sam’s construction plans enable you to build from raw materials, but the value of the kit is twofold. First, we source the best materials for your project. Second, the accuracy of CNC cutting ensures that you will have an easy time building your boat straight and true. 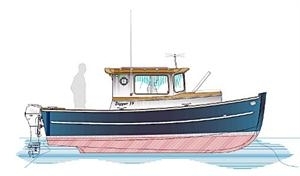 The kits provide a solid foundation for building your boat the way you want to build it. Power? Sail? Rowing? Dozens of Devlin designs are available from the catalog menu link. Malone Boatbuilding did an outstanding job on their most recent build of a 36' houseboat from a kit supplied by Devlinkits! We think this is a very cool design and would love to see another. Contact Jeff Meeks if you'd like us to create a kit for you! The Devlin catalog has such wonderful options, that I'm sometimes surprised at which models become favorites. This summer, the Dipper 19 has been a very popular choice, and in taking a second look, it become apparent why.